Two things up front: First, this is a tall tale. Second, because it’s a tall tale (and because it’s meant for beginning(ish) readers), there’s not much substance to it. That doesn’t mean it’s not enjoyable; it is. I enjoy Gaiman’s stuff normally, but I really do think I prefer his whimsical works for younger kids. This one is basically the tale of a dad who went out to get milk for the morning cereal, and had a wild adventure getting back home. 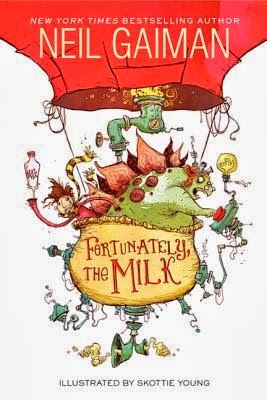 There are hot air balloons (or rather “Professor Steg’s Floaty-Ball-Person-Carrier”), pirates, piranhas, aliens, time travel, and even sparkly ponies. Of course, the kids don’t believe the dad, because he’s obviously telling a story. Or is he? As I said, this is delightful. The illustrations are brilliantly funny, and I laughed aloud at many parts. My only problem with the book is that I would have liked it better if it had been a true middle grade novel, and one of the kids had had the adventure, rather than their father doing all the cool, fun stuff. But that’s such a minor quibble. I’m going to hand this one to K to see what she thinks. I have an inkling that she’ll like it. I would have liked to see the illustrations by Chris Riddell in the UK edition, but this one is cute. I just borrowed this one from my kids' elementary school library. I can't wait to read it. LOVE Gaiman! In educational sector, all services have only main focus or strategy in order to sustain within the industry. That is help with coursework designed for preparing the academic term. In addition by doing such tasks the services establish themselves as the assistance for the students at a glance.